Nithin Scidanandh took up athletics seriously only four years back and since then has been on the fast track, literally. After medals at the junior South Asian Championship and nationals, the Tamil Nadu teenager completed a sprint double in the Khelo India Youth Games here on Sunday. Scidanandh clocked a personal best of 21.57 seconds to clinch the U-21 200m gold on the last day of athletics. He had clocked 10.76 seconds in the 100m to crown himself the fastest of the meet two days earlier. He knows the road ahead will be tough. “My next target is to do 200m under 21 seconds. The national record stands at 20.63 seconds (Muhammed Anas) and I want to break that,” the 19-year-old B. Com student of Vivekananda College, Chennai, said. To progress in the longer sprint, he wants to give up 100m. “I want to concentrate on 200m and 400m. Realistically, I don’t think I will be able to do 100m in under 10 seconds, which is a prerequisite to do well at the top level. My personal best in 100m is 10.70 seconds. I think my age is right to make the transition to 400,” said Scidanandh, who clocked 21.63 seconds en route to winning silver at the 2018 South Asian Athletics Championships in Colombo . Scidanandh was followed by Jharkhand’s Amit Yadav (21.73 secs) and Kerala’s Abhinav Chalangode (21.76 secs). Tamil Nadu athletes finished on top in two other events — U-17 long jump (P David –7.13m) and U-17 800m (B Mathesh). Kerala also won three gold medals. Hosts Maharashtra missed a sure-shot medal in athletics as their U-21 boys’ 4x400m relay team was disqualified for pushing an opponent. Only three teams had participated, with Kerala winning the gold and Tamil Nadu the silver. No bronze medals were awarded. Devanshi Rana, ace pistol shooter Jaspal’s daughter, won the U-21 women’s 25m pistol gold by holding off a strong challenge by Haryana’s Anjali Choudhary. The final went down to the wire with the Delhi girl triumphing 24-23. Abhidnya Ashok Patil (Maharashtra) took the bronze. 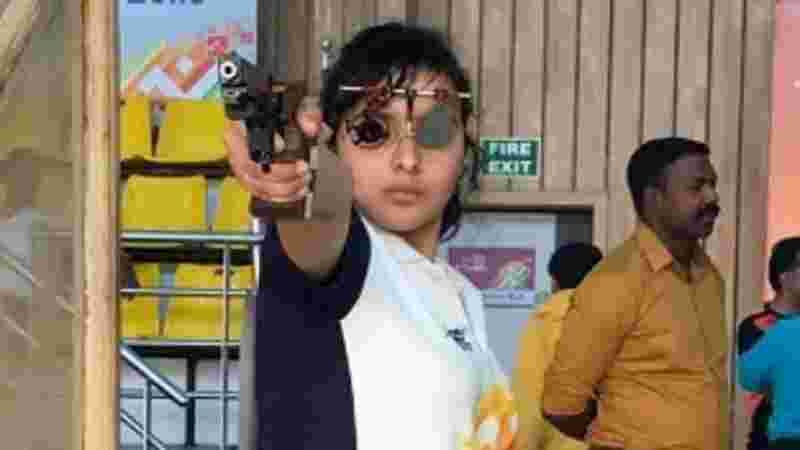 West Bengal’s Mehuli Ghosh became the first double gold medallist in shooting as she teamed up with 10-year-old Abhinav Shaw in the 10m air rifle mixed team event for the gold. In mixed trap, Manisha Keer combined with Anwer Hassan Khan to win her second gold of the event. She had won the women’s trap on Saturday. The Madhya Pradesh pair shot down 35 birds in the 50-shot final. On the last day of badminton events, the home state’s shuttlers won two gold with Aarya Deshpande and Ananya Phadke winning the U-17 girls doubles final and Aman Farogh Sanjay winning the U-21 boys singles. Rajasthan, Gujarat, Telangana and Chattisgarh won one title each. Karnataka and Delhi opened their gold tally in weightlifting with Akshata Kamati and Harshit Sehrawat winning the U-21 Women’s 71kg and U-21 Men’s 96kg respectively. In the U-21 men’s hockey, Haryana and Odisha won their semi-finals to set up a title clash. Haryana defeated Punjab 3-1 while Odisha edged past Uttar Pradesh 2-1. Maharashtra finished gymnastics on top with 18 medals (nine gold, six silver, three bronze). In judo, Delhi finished with a tally of six gold medals each in the U-17 and U-21 categories. Of the 12 gold medals at the stake in swimming, Maharashtra won four while Delhi and Karnataka took three each. Chhattisgarh and Gujarat claimed one each.